For those unaware, Morning Musume is my all time favorite music group. They are a girl group from Japan! I explain precisely why I like idols in this post. But if you don’t feel like reading that post.. to summarize, they’re really super adorable and inspirational. They’re normal girls just trying their best! For now, I’d like to focus on when I went to see their concert in Japan. Well, let me just start off by saying it was AMAZING! I’ve been then their fan since 2003. And I have been obsessed with them every everrrrryyy single day. So imagine, I’ve had this thought in my head every day for 10 years! And finally, in 2013, my dream came true. The concert was in the afternoon. But all day in the morning on the way to the concert hall, I was teary eyed. I just couldn’t believe it was finally happening! Was there going to be a car accident that would prevent me from going? I don’t know.. It just can’t be real! The concert wasn’t in Tokyo. It was in Utsunomiya – a couple hours from Tokyo. And I had a friend that was kind enough to drive me there. I was so lucky! Before we went to the hall, we visited a couple of tourist spots. 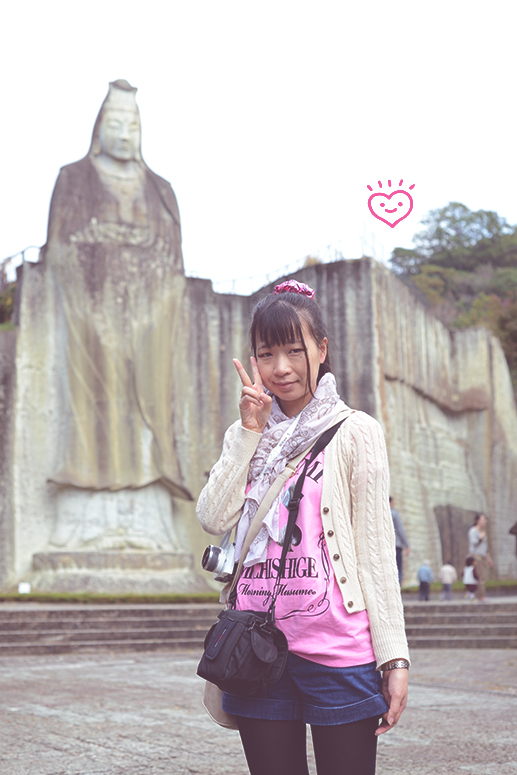 Look at me with this massive statue (in my Sayumi wear no less!). Well, after this, we did go to the concert hall. I saw many female fans there dressed really super cute! I was so nervous the whole time. My heart was beating so hard and I just felt like I was floating the whole time! But I had to focus. The doors of the concert hall only opened 1 hour before the actual concert started and I arrived just at that time. My main priority was to go to the merchandise stand and go nuts! First, I had to go the toilet though to make sure I looked nice! After that, I went to the stand. To my surprise, the line spanned the staircase for 3 floors. I couldn’t believe it!!! When I finally made it to the front of the line to purchase items, I felt really bad. Because I don’t speak Japanese.. well, I was totally holding up the line trying to tell them what I wanted to buy! In the end, a. bought a Riho T-shirt, I bought a Sayumi bag, and we got a couple of pictures. I feel bad not giving trainees attention when they’re not really paid attention to like Morning Musume. I’m soooo sorry! Shortly after we sat down, the concert had started! This is the part where I really have a hard time putting it in words.. 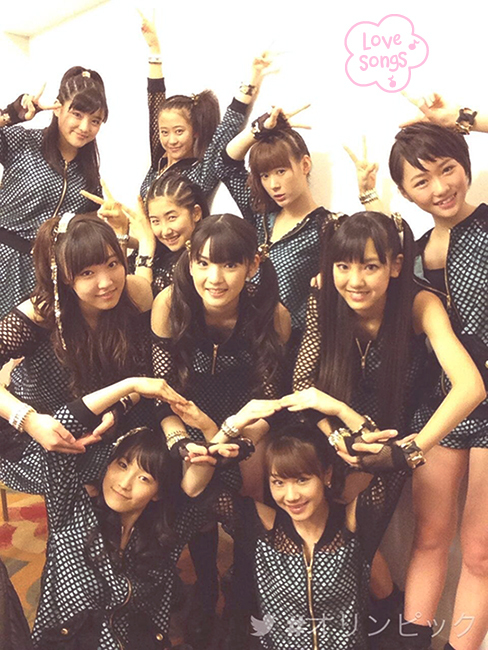 But Morning Musume is truly amazing. They are not the most talented girls, but the fact they try their best is just so heartwarming.. Seeing them give their best on the stage made me so happy. The tension during the concert was so high! I completely lost myself during the time! I didn’t think about where I was or anything external. All I thought about was enjoying the concert in front of me and along with it dancing and singing! It actually required a lot of my focus doing the cheering! Did you know Japanese fans have a time during each song to clap and cheer? You don’t just do it randomly whenever you want! Since it was my first time, I was quite unsure. But by the end of the concert, I was starting to get the hang of it! Seeing the way Japanese fans enjoy the concert was a completely different experience to me. For example, I don’t have any pictures of the concert. You are not allowed to make videos or take pictures! But with so many smartphones nowadays, it’s such an easy thing to do… yet none of the Japanese fans do it. Of course, I followed their etiquette too! It’s strange how in the West, it’s pretty much a given people will break the rules, but in Japan, they are very strict! Anyways! Traveling all the way to Japan to see Morning Musume was truly worth it. I’ve seen other artists in concerts, but I never saw a concert so enjoyable. Sure, none of the girls in Morning Musume write the songs or anything. But I really believe they pour their heart into it. And after all this time, I felt the tension in my heart was finally released too. I now know what it is like to see Morning Musume in concert! Thanks for reading my super long post. I hope the girls that requested the post read what they wanted to read! P.S. I actually saw Morning Musume in Paris at Japan Expo in 2010. It really wasn’t the same experience even though I liked the girls in the group at that time much more. The concert was roughly 1 hour as opposed to 2. And the fans there was a lot less organized with the clapping, etc. Somehow, I feel that makes a very big difference. When everyone gets into it and you have thousands of people doing it, it’s a completely stunning feeling!